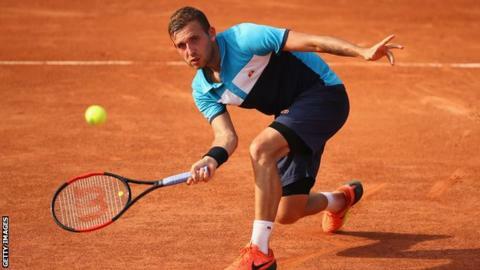 Britain's Dan Evans has earned a place in the main draw at next month's French Open at Roland Garros. He is joined by compatriots Kyle Edmund and Cameron Norrie in the draw for the men's singles, while two more Britons, Johanna Konta and Katie Boulter, are entered into the women's singles. It is the first time in two years that world number 89 Evans has made the main draw by ranking. He returned from a one-year ban for taking cocaine 12 months ago. The 28-year-old has only once before played in the first round of the French Open, in 2017, when he was beaten by Spain's Tommy Robredo. Edmund reached the third round in 2018, while Norrie exited in the second. Two-time Grand Slam semi-finalist Konta has never progressed past the first round, while this year marks Boulter's debut in the main draw. The French Open takes place in Paris between 20 May and 9 June.